The immune and lymphatic system of the head and neck includes the tonsils, several sets of lymph nodes, countless lymphatic vessels, and red bone marrow. All of these structures work together to drain, filter and cleanse the interstitial fluids of the head and neck and destroy harmful pathogens that may infect this region. 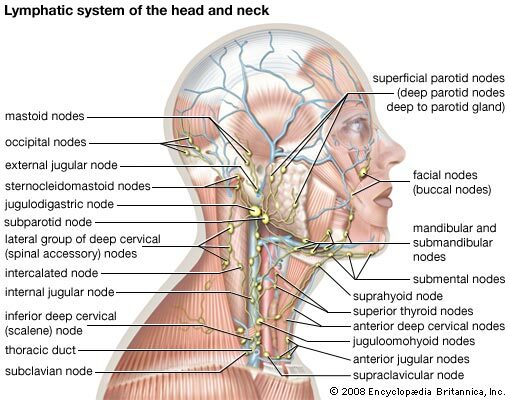 A vast network of interconnected lymphatic vessels and their associated lymph nodes extends through the tissues of the head and neck. This network serves as the drainage and filtration pathway for the blood plasma that leaks from capillaries into the tissues and becomes interstitial fluid. Interstitial fluid fills the spaces between cells within tissues and provides nutrients to the cells while picking up waste products. Many solid materials also get picked up by interstitial fluid, including pieces of dead cells; pathogens such as bacteria and viruses; and even tumor cells. Tiny lymphatic capillaries present in the tissue draw interstitial fluid into their lumen, where it becomes known as lymph. Lymph travels through the lymphatic capillaries, which join together at lymph nodes so that the lymph can be filtered and passed on to larger lymphatic vessels. Lymph nodes - tiny organs shaped like kidney beans - contain reticular tissue with many reticular fibers for filtering lymph. Many immune cells - such as macrophages, T lymphocytes and B lymphocytes - are present in the lymph nodes to destroy pathogens and tumor cells and clean up any debris present in the lymph. The lymph nodes of the head are arranged into eight main groups named after their locations and associated structures. These groups include (from posterior to anterior) the occipital, posterior auricular, anterior auricular, parotid, facial, deep facial, lingual and retropharyngeal. Each group varies in size and number of lymph nodes, but they all receive lymph from the countless lymphatic capillaries distributed throughout the tissues of the head. From the lymph nodes of the head, lymph passes inferiorly into the cervical region. In the neck are five groups of lymph nodes that drain lymph from the tissues of the neck: the submaxillary, submental, superficial cervical, anterior cervical and deep cervical nodes. Of these groups, the superficial cervical nodes are the most easily palpated through the skin of the neck just inferior to the jaw. The deep cervical nodes are the largest lymph nodes in the neck and receive lymph from all of the lymph nodes of the head and neck. Lymph from the right deep cervical nodes descends through the neck in the right jugular trunk before reaching the right lymphatic duct. On the left side, lymph from the deep cervical nodes descends through the left jugular trunk before arriving at the thoracic duct. Both the right lymphatic duct and the thoracic duct release lymph into the subclavian veins, where it circulates throughout the body as blood plasma. Five tonsils surround the nasal and oral cavities of the head: two lingual tonsils, two palatine tonsils and one pharyngeal tonsil. Each tonsil is a dense mass of lymphatic tissue covered in mucous membrane continuous with the surrounding tissues. The pair of lingual tonsils is located at the posterior root of the tongue in the floor of the mouth, near the pharynx. On the sides of the region where the mouth meets the throat is the pair of palatine tonsils. The palatine tonsils are large and easily seen by looking inside the mouth. In the posterior of the nasal cavity, the pharyngeal pharynx (also known as the adenoid) lies along the body’s midline in the nasopharynx. The tonsils protect the body by detecting and destroying pathogens that are inhaled through the air or consumed in food or drink. Many T and B lymphocytes are found in the tissues of the tonsils and function as pathogen detectors and triggers of the immune system. The tonsils often become inflamed in response to an infection and may grow large enough to block the flow of air through the throat.